In the livingroom you find mid century modern furnishings: Elegant teak table for dining and breakfast. Convertible couch, wall mounted flat screen TV with basic cable. Original artwork and antique herringbone parquet make this a truly beautiful home! 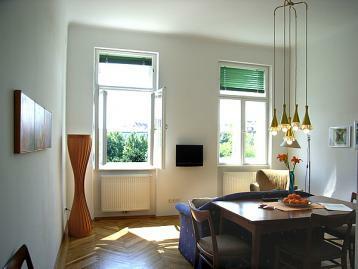 The view over Max Winter Platz lets you enjoy a peaceful setting in the center of Vienna! Free Wifi Internet throughout the flat!